By using ArcGIS, RONA reduced its external consulting budget by 100 percent. With GIS, RONA's flyer distribution department can justify every promotional decision. RONA used ArcGIS to develop analysis tools that provide market intelligence at the touch of a button. For a direct mail campaign to succeed, it must be targeted. It takes research, careful planning, and customization to ensure that the right message reaches the right individuals—those most likely to become repeat buyers. Nobody understands this better than Canada's largest hardware, home renovation, and gardening products retailer, RONA. 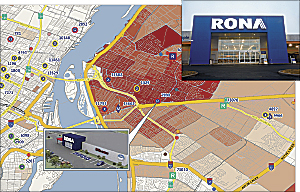 RONA is headquartered in Boucherville, Quebec, with administrative centers across Canada in Surrey, British Columbia; Calgary, Alberta; and Toronto, Ontario. The company was founded in 1939 by a group of independent Montreal-area hardware retailers to compete with larger wholesalers to get the best prices from manufacturers. Today, there are more than 800 corporate, franchise, and affiliate stores of various sizes and configurations across the country. All these stores are serviced by RONA's Geomatics and Market Intelligence department. This map shows the highest-performing promotional flyer route for the store pictured based on the number of flyers delivered and sales generated. Like many successful companies, RONA reaches out to its customers with direct mail that is delivered to a customer's door. After some initial research, RONA discovered that a high volume of flyers was being sent to areas that was not necessarily developing into sales. Since paper and direct mail campaigns are expensive, a more targeted approach to flyer delivery was required. In the past, RONA had been working with an external firm that provided a global view of the entire distribution network so that delivery areas could be planned strategically. While this approach facilitated a targeted distribution plan, working with an external firm had its own set of challenges. The process was difficult to manage, and there were costly delays. As a result, RONA decided to take matters into its own hands and develop an internal application that would optimize flyer delivery. After assessing many solutions available, RONA decided to implement its own mapping system, based on ArcGIS and Microsoft Access. To analyze customer information, RONA used many different datasets from Statistics Canada, Canada's central statistical office that conducts a country-wide census every five years and produces statistics that are made available to individuals and organizations throughout the country. RONA also combined city maps and information from a popular national loyalty rewards program, AirMiles, to generate a nationwide snapshot of customers. The system RONA developed allows staff to closely monitor customers through individual profiles linked to specific trade areas. By displaying information visually and effectively analyzing relationships between people, places, and behavior, new patterns and trends were revealed that would not have been evident using traditional business systems. RONA also leveraged Esri's ArcGIS to develop analysis tools that provide market intelligence at the touch of a button. For example, users can analyze store market areas to see where markets overlap, find out which customers subscribe to newsletters, pinpoint neighborhoods that contain a high concentration of customers, and then print off their data in usage reports. "We continuously scan Canada's markets, and using GIS lets us quickly develop distribution strategies for new, expanded, or relocated stores," says Simon Généreux, manager, Geomatics and Market Intelligence at RONA. "As a result, we're distributing 10 percent fewer flyers, which is saving us thousands of dollars per year." Data can be extracted and shared with RONA's suppliers and distributors. Within minutes, RONA can determine the quantity and version of flyer that is needed for each trade area and provide this information to suppliers. A distribution module is directly integrated with ArcGIS so that the supplier can strategically plan the most effective flyer distribution runs using easy-to-understand map views. Flyer orders are then placed directly through the application. With a more targeted approach to marketing, RONA is better able to serve its store network of 800 stores located across the country. By leveraging an in-house customized ArcGIS application, staff can analyze geographic areas and match the best flyers to the correct stores. This has virtually eliminated accidental shipping of promotional flyers to areas where the promotion was not occurring. RONA's Geomatics and Market Intelligence department now finds it easier to create and adhere to annual budgets because it can see at a glance the precise number of flyers that will be distributed in the coming year. The company has saved money by eliminating promotional flyers in underperforming zones and by focusing energies on areas of high customer concentration. By no longer relying on an external company to conduct data analysis, RONA has also been able to save costs. In fact, by bringing the flyer distribution process in-house, RONA has reduced its external consulting budget by 100 percent. For more information, contact Simon Généreux, manager, Geomatics and Market Intelligence, RONA.